If you want to make a good impression, nothing says "professional" like quality mounting. With a varying selection of thicknesses and materials, you can finish your job just the way you imagined. We offer a full range of mounting substrates, including acid-free and super thick variations. Bring us your black and white or color print, exhibit piece or tradeshow design and let us mount it for today. Foamcore, also called foam board, is an economical way to mount images in full, vibrant color on a resilient, lightweight material for temporary use, such as tradeshows. Foamcore is easy to size, has a built-in memory, and is lightweight yet sturdy. 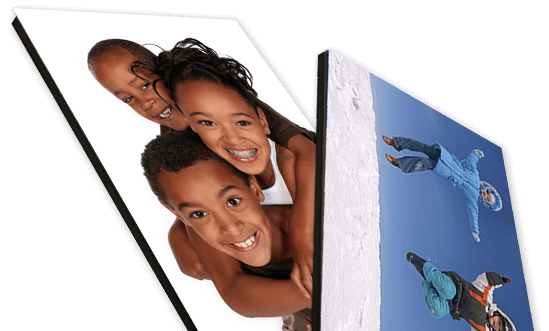 Stronger than Foamcore but with a similar weight, Gatorboard is an ideal choice for photo mounting, exhibits, and indoor displays that require rigidity, durability, and warp resistance. The rigid polystyrene foam core of Gatorboard rests laminated between resin-infused wood fiber veneers, which gives it a harder surface than Foamcore and makes it moisture resistant. Lightweight and durable, Sintra is an archival mounting material made of PVC plastic that’s ideal for long-lasting indoor and outdoor print applications. Sintra is resistant to UV damage, dents, scratches, moisture, and chemicals, which makes them an excellent choice for displays, exhibit booths, cutouts, and photo mounting. Corrugated plastic, also known by the brand name Coroplast®, is a tough, waterproof, plastic sign material which resembles the appearance of "plastic cardboard". The hollow-fluted design of Coroplast makes this sign material extremely lightweight, easy to handle and simple to display in a number of ways. One of the first aluminum composite sheets, Dibond panels have polyethylene cores between two aluminum surface layers. Dibond is extremely stable, durable and suitable for interior and exterior applications with its resistance to weathering, temperature variations, and corrosion. Dibond has an absolutely flat, stiff surface with made of a rugged material, virtually maintenance-free, and extremely long-lasting.